Anthropogenic land use is one of the dominant drivers of ongoing biodiversity loss on a global scale and it has often been asked how much biodiversity loss is “too much” for sustaining ecosystem function. Our new paper in the journal Science came out last week and attempts to quantify for the first time the global biodiversity intactness within the planetary boundary framework. I am absolutely delighted to have contributed to this study and it received quite a bit of media attention so far ( https://www.altmetric.com/details/9708902 ) with a number of nice articles in the BBC and the Guardian. 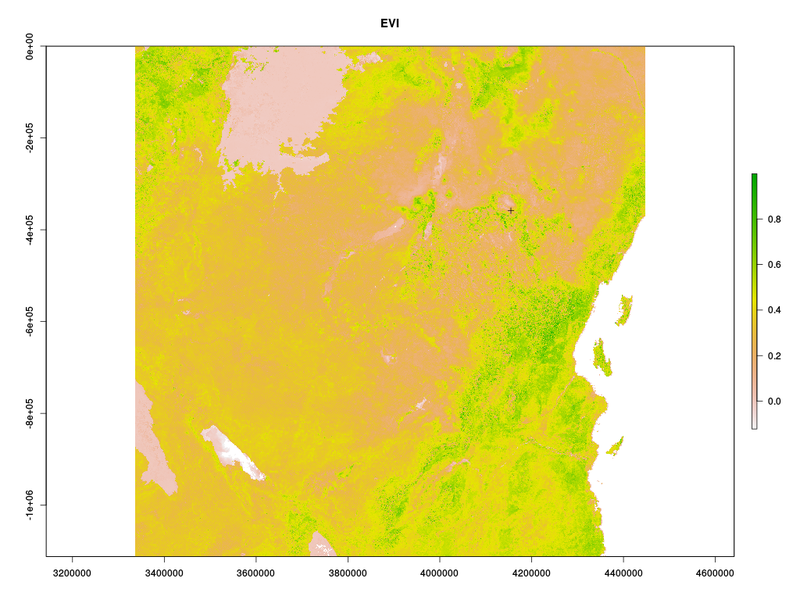 In our study we calculated the Biodiversity intactness index (BII) first proposed by Scholes and Biggs (2005) for the entire world using the local biodiversity estimates from the PREDICTS project and combined them with the best available down-scaled land-use information to date. We find that many terrestrial biomes are already well beyond the proposed biodiversity planetary boundary (previously defined and set as a precautionary 10% reduction of biodiversity intactness). Unless these ongoing trends are decelerated and stopped in the near future it is likely that biodiversity loss might corroborate national and international biodiversity conservation targets, ecosystem functioning and long-term sustainable development. New article in which I am also involved. I have told the readers of the blog about the PREDICTS initiative before. Well, the open-access article describing the last stand of the database has just been released as early-view article. So if you are curious about one of the biggest databases in the world investigating impacts of anthropogenic pressures on biodiversity, please have a look. As we speak the data is used to define new quantitative indices of global biodiversity decline valid for multiple taxa (and not only vertebrates like WWF living planet index). Biodiversity continues to decline in the face of increasing anthropogenic pressures such as habitat destruction, exploitation, pollution and introduction of alien species. Existing global databases of species’ threat status or population time series are dominated by charismatic species. The collation of datasets with broad taxonomic and biogeographic extents, and that support computation of a range of biodiversity indicators, is necessary to enable better understanding of historical declines and to project – and avert – future declines. We describe and assess a new database of more than 1.6 million samples from 78 countries representing over 28,000 species, collated from existing spatial comparisons of local-scale biodiversity exposed to different intensities and types of anthropogenic pressures, from terrestrial sites around the world. The database contains measurements taken in 208 (of 814) ecoregions, 13 (of 14) biomes, 25 (of 35) biodiversity hotspots and 16 (of 17) megadiverse countries. The database contains more than 1% of the total number of all species described, and more than 1% of the described species within many taxonomic groups – including flowering plants, gymnosperms, birds, mammals, reptiles, amphibians, beetles, lepidopterans and hymenopterans. The dataset, which is still being added to, is therefore already considerably larger and more representative than those used by previous quantitative models of biodiversity trends and responses. The database is being assembled as part of the PREDICTS project (Projecting Responses of Ecological Diversity In Changing Terrestrial Systems – www.predicts.org.uk). We make site-level summary data available alongside this article. The full database will be publicly available in 2015. The Sun is shining, birds are singing and most scientists have nothing better to do than jetting around the globe to attend conferences. Yes, it is summer indeed. Here is some advertising for the 2014 Tropical Ecology – Early Carer Meeting of the British Ecological Society. This year the fun is happening in York. As many people seem to be on vacation the deadline for abstracts has been extended to the 14th of July. See the attached Documents ( BES-TEG 2014 Flyer ,BES_TEG Key speakers ) for more information. I will be there as well… . The British Ecology Society – Tropical Ecology Group (BES-TEG) are organizing a 7th early career meeting scheduled to take place at the University of York, on the 14th and 15th of August 2014. Day one will focus on Ecology and Ecosystem Processes while day two will focus on Practical Applications and Links to Policy; such as conservation, livelihood, policy and development. All early-career researchers, both PhD and Post-Docs, are welcome to present their tropical ecology related research as a poster and/or oral presentation. The deadline for abstract submission has been extended to Monday the 14th of July 2014. Please find attached the flyer and conference document for detailed information. It would be appreciated if this flyer circulates within your department. Students are encouraged to come to York for what should be a really interesting few days in August. Just now another very interesting paper has been published in Nature Communications, which was written by former colleagues of mine from the University of Marburg. As we all know many insect species like butterflies, bees or dragonflies have their main activity pattern during the day due to their ectotherm thermoregulation. Body colour is an important aspect of this thermoregulation as darker ( more blackish) individuals usually heat up faster. Therefore darker insects have an advantage compared to brighter insects in cooler climates as they heat up more rapidly and can forage earlier. This pattern can be mapped on a larger scale using occurrence data and has been known as “thermal melanism hypothesis” in macroecology. The authors go a step further from here as they not only display a new biogeographic pattern previously unknown to science ( colouring gradient of European dragonflies and butterflies from south to north), but they also demonstrate how this mechanistic link between a macroecological pattern and a functional trait can be used to forecast the effect of climate change on insects. From Zeuss et al. (2014): Shift in colour value for (a) the raw data; (b) the phylogenetic component (P); and (c) the specific component (S). Red indicates an increase in colour lightness; blue indicates a decrease in colour lightness. The diameter of each dot indicates the extent of the shift (n=1,845). The distribution of the shifts shows for the specific component a clear trend towards higher (that is, lighter-coloured) values (peak of the distribution positive; zero indicated by black line). The phylogenetic component suggests that the shifts in colour lightness have a strong phylogenetic background leading to a complex geographic mosaic in the response of assemblages to climate change. The inserted histograms show the mean change in colour lightness calculated for 1,000 alternative phylogenetic trees and are positive throughout, indicating that uncertainties in the phylogenetic hypotheses are unlikely to affect our conclusion of a general shift towards lighter assemblages. The distributional information used in the analysis is often based on a large time span, that is, the distributional information published in 1988 summarizes data until that year using information even from the beginning of the twentieth century. Rugs at the abscissa indicate observed values. Possible critics: A definite next step in the analysis would be to include real measurements of optical colour rather than RGB values of scanned pictures. The colour values used in this study were all derived from scientific taxonomic drawings of those insects and thus biased by subjectivity of the respective artist. Nevertheless this bias should be consistent (if the same artist has sketched the images) so it should not influence the colouring gradient. It is also interesting to note that many insects ( I know this for instance from my work with bugs and hoverflies) can adapt their body colouring to their habitat or differ quite a lot within a population. Differing melanism in body color and wing colouration might be related to the climatic niche they occur in, but the insects themselves might also possess phenotypic plasticity to adapt for instance to different habitats and background (Hochkirch et al. 2008). This pattern certainly needs more investigations in the future. Hochkirch, A., Deppermann, J. and Gröning, J. (2008), Phenotypic plasticity in insects: the effects of substrate color on the coloration of two ground-hopper species. Evolution & Development, 10: 350–359.